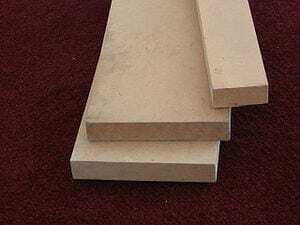 A new biodegradable and recyclable form of medium density fibreboard (MDF) has been created that could dramatically reduce the problem of future waste. Today (31 October), Professor Andrew Abbott is awarded the Royal Society Brian Mercer Award for Innovation 2013 that will help him make the critical step from prototype to product. Almost one million tonnes of MDF is produced in the UK every year. It is a cheap and popular engineered wood product widely used for furniture and other products in homes, offices and retail businesses. However, as MDF cannot be recycled, waste MDF either has to be incinerated or ends up in landfill. Professor Abbott and his team at the Department of Chemistry at the University of Leicester have developed a new wood-based product similar to MDF that uses a resin based on starch from completely natural sources, including potatoes. A significant proportion of MDF is used for short term applications in the retail sector. The use of a material which can either be recycled or composted would be a significant benefit to an industry often criticised for the amount of waste it generates. MDF is made by breaking down bits of wood into wood fibres, which are then pressurised and stuck together with resin and wax. The resin is currently composed of urea and formaldehyde (UF), the use of which is restricted due to health concerns. Professor Abbott’s new resin means that the use of UF is avoided and therefore so too are the associated concerns. With the aid of colleagues at the Biocomposites Centre, Bangor University and the Leicestershire-based retail design company Sheridan and Co., his team have produced starch-based boards which have been made into retail display units. Professor Abbott’s new material is easier to manufacture and easier to work with than current MDF boards. The new material is easier to manufacture than existing MDF as the components are easily pre-mixed and only set on the application of heat and pressure; end user feedback suggests it is also easier to work with than currently available MDF boards. April 15, 2019 - Protomax takes on an Italian job British Plastics and RubberUpcycled waste plastic produced in the West Country has made an impact at an Italian design show. December 17, 2018 - Chip[s] Board should become Ikea's next building material. Fast CompanyFeed the hungry with potato chips and build fully recyclable furniture at the same time? Ikea, get your Swedish hands all over this. June 28, 2018 - MDF Recovery receives further funding letsrecycle.comA Welsh company that is developing a technology to recycle medium-density fibreboard (MDF) waste has received a further £165000 in funding. March 15, 2017 - MDF recycling solution is a world first for British firm ExpressHow do you solve a problem like MDF board, a favourite of furniture makers, shop fitters, builders and DIYers but a waste disposal nightmare? November 1, 2013 - New recyclable MDF could help solve UK waste problem Phys.OrgA new biodegradable and recyclable form of medium density fibreboard (MDF) has been created that could dramatically reduce the problem of future waste. March 28, 2019 - 2019 Global berry Congress, Rotterdam FreshPlaza.comFreshPlaza, portal for the *fresh* produce industry, offering the latest news, job advertisements, pricewatching, and photo reports.